Wherever your card touches a customer to exchange value, CardLogix can help. We have supplied millions of smart cards over the past ten years to literally hundreds of applications that do just that. CardLogix Loyalty and Stored Value cards give customer reward programs an added edge. They replace paper, are easy to use, and track vital data for spending incentives. Smart and Contactless Cards can track spending volume and trends, and even process special offers. Stored value (i.e. 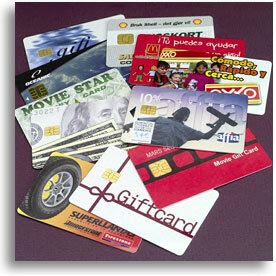 gift cards) further encourage loyal spending at your business and with your marketing partners. Enabling retailers and merchants to build affinity with a customer and enticing them to store value on a card is our goal. We accomplish this with a wide range of cards, software, and partnerships that are specific to the unique demands of today’s media-saturated customer. CardLogix can also support your card programs with a complete range of fulfillment options. If you are building a system or are just learning about how each technology should be applied in a system, we recommend that you review our Loyalty & Stored Value Cards white paper. From car dealerships to pizza parlors, our smart cards are empowering many value propositions that are harvesting real rewards for the card issuers. By building your system with CardLogix cards and software platforms, you can enable every customer touch point to your organization. NOTE: If you are looking to use a card in a client-server application where all data for the customer is stored on one server, CardLogix offers a full line-up of magnetic stripe and/or barcoded cards for your retail gift, loyalty, and stored value programs.